Earlier today, I watched the goalless match between Heart of Lions FC and Mighty Jets FC. I have to say that this is probably the poorest match of Ghanaian football I have ever seen. To be fair, the field was in a terrible condition and it was not easy to control the ball. Joseph Addo (born 02.11.1990) was between the posts for Heart of Lions FC, while the defence consisted of left-back Solomon Addy (born 09.04.1989) right-back Prosper Avor and central defenders Badu Richard Asiamah (born 20.12.1988) and David Smallboy Korbah (born 04.03.1986). The defence was troubled two times – when Korbah missed a clearance, allowing Benjamin Eli Agbeko to get a shot at goal, and when Abubakar Sidi Soufian ran past his markers. In both occations, goalkeeper Addo saved his team, impressing with his patience and his ability to wait out the attackers, forcing them to make the the first move. Addo seamed rock-solid but struggled with his kicking. Addo was widely regarded as a future goalkeeper for the Ghana national football team a few seasons ago, but lately his development has slowed a bit down. Avor is a big, strong right-back who is useful at set-pieces but I have seen him much, much better than today. From my point of view, Asiamah was man of the match. He is indeed a strong, rugged central defender – very effective but not very spectacular. Addy and Korbah had a rather quiet game. John Nanitey (born 25.11.1990) and Emmanuel Anarfi (born 18.10.1986) controlled the central midfield. Anarfi is extremely hard-working but failed to shine. Nanitey was an interesting acquaintance. The former midfielder of Eleven Wise FC proved to be creative midfielder who joined the attack at several occations. Nanitey was replaced with Franklyn Osei in the second half. Daniel Kofi Bonsu (born 28.08.1991) worked hard at the left-wing while captain Ofosu Amoah (born 25.12.1984) played at the right. Bonsu, the lively attacker, had a difficult evening and Amoah was almost invisible before he was replaced with Daniel Acquaye at half-time. Acquaye was not much better, switching over to the left from time to time. Amoah and Acquaye are experienced players who should perform better. Youngster Benjamin Fadi and the burly top scorer Gilbert Fiamenyoh (born 06.07.1992) played up front. Fadi is very strong and and held up the ball well, leaving the finishes to his striking partner. I have never before seen Fiamenyoh play and it was interesting to see how burly this young man is. Fiamenyoh, who is linked to Ukrainian football, is built like a rock and must be a nightmare to mark. However, he must work with his finishes, although five league goals in 13 matches it not too bad. Fiamenyoh was replaced with Isaac Donkor (born 16.11.1991) in the second half. Frank Andoh (born 21.09.1986) had a good game in goal for Mighty Jets FC. The experienced goalkeeper is usually second-choice behind Issahaku Shaibu. Isaac Nartey played at right-back while Isaac Klevor played at the left, while Musah Inusah and Isaac Owusu battled hard in the central defence. The four defenders all did well but from my point of view, only Inusah stood out. Inusah is a big, rock-solid defender. Captain Emmanuel Laryea seemed to play in a defensive midfield role, shielding the defenders. Laryea is obviously a quality player and I have heard great things about him. However, besides working hard he did not impress me today. Mamudu Salifu and Mubarak Sinare played in the central midfield. Youngster Benjamin Eli Agbeko played at the left-wing while the lively Tamimu Muntari was at the right. Sinare and Agbeko are both products of the highly regarded Unistar Soccer Academy and they showed glimpses of quality. Especially Agbeko was lively at the left, though not very effective. In such a poor game, I give him credit for his efforts and his left-foot could bring him far in Ghanaian football. According to http://www.mm4management.com, Agbeko is born 18.05.1995. The picture is of Agbeko and is taken from the same webpage. Agbeko was replaced with Abdulai Osman. Sinare and Salifu worked hard but were not very constructive, mostly trying to break down the play of Heart of Lions FC. Muntari was a breath of fresh air and from my point of view, the most interesting player at Mighty Jets FC. Muntari loves to dribble and the few times he challenged the defenders of Lions, he looked dangerous. Abubakar Sidi Soufian played as a lone striker. Sidi Soufian is a former member of the Ghana U-20 national football team and widely considered as the hottest prospect at Mighty Jets FC. Sidi Soufian, the current top scorer at the team with three league goals, is big and strong and did a good job up-front, but was hopelessly alone most of the time. 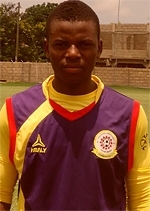 Sidi Soufian was replaced with Kofi Asiamah, formerly of Hearts of Oak SC.